Ten loud explosions that rocked Kandahar one day last week actually signaled good news on the front line of the war against the Taliban. The blasts  one every 30 minutes from 10 a.m. until 2:30 p.m.  were from Afghan and coalition forces blowing up more than 6,000 pounds of Taliban AK-47s, bomb-making equipment, homemade explosives and rocket-propelled grenades. Finding and destroying the insurgents' weapons in Kandahar province, the ancestral home of President Hamid Karzai and the birthplace of the Taliban, is just one way Afghan and coalition forces are trying to make it difficult for the militants to launch a strong offensive in the spring. In advance of an increase in fighting expected in the spring, they also are working to demolish Taliban hideouts, kill and detain their leaders, and professionalize police who patrol this city of 800,000 people  the largest in southern Afghanistan. Civilian workers are pushing forward with development projects and trying to help recruit Afghans for government jobs  even though signing up makes them a target of the insurgency's murder and intimidation campaign. "We are definitely expecting them to come back at us hard," said Lt. Col. Victor Garcia, deputy commander of the 3,500-soldier 1st Brigade Combat Team, 4th Infantry Division deployed in Kandahar province on one of the NATO coalition's most critical missions. "If anything, they have to send a message that they are still a force to be reckoned with. I believe the Taliban sense that they've lost some momentum and now they're trying to regain some of that and demonstrate to the population that they still can inflict harm." Militants did just that Friday in another blast heard around the city. A suicide bomber rammed his car into the home of Kandahar Provincial Police Chief Khan Mohammad. He survived that attack, which came three days after a mine exploded just as the police chief's vehicle passed by, and a week after the deputy governor of Kandahar was killed when a suicide bomber on a motorcycle drove into his motorcade. Until late last year, insurgents roamed with little resistance throughout Kandahar province. They clustered outside the city in places like Zhari, Panjwai and Arghandab districts. There, they slept, trained and made bombs to attack targets in the city of Kandahar and fight coalition and Afghan forces. The Taliban had a psychological hold on the citizens, who had little faith in the Karzai government in Kabul or in the international community's effort to halt the insurgents' momentum. Last summer, after the 40,000 mostly U.S. reinforcements finished arriving in Afghanistan, coalition and Afghan forces launched bloody offensives to force insurgents from their strongholds. Casualties went up, making 2010 the deadliest year of the more than 9-year-old war. Security improved and the game plan now is to hold the territory, giving the Afghan government and international community an opportunity to rush in development and bolster governance to win the loyalty of the citizens. No one knows if the troops can maintain their current grip on the area. The Taliban are outgunned by the thousands of Afghan and coalition forces in Kandahar province, but just one targeted killing  like the assassination of the deputy governor of Kandahar  is a psychological setback to pro-government troops. Garcia likens the current state of play in the battle for Kandahar to a three-dimensional chess game. "It's not just our side against their side, there's the population in the center  many of whom are sitting on the sidelines waiting to see who is going to come out on top," he said at Camp Nathan Smith, a U.S.-run base on the outskirts of the city. "Some are tacitly supporting the Taliban because they are fearful. They turn a blind eye and allow the Taliban to transit through their area as long as they don't harm the people of their village." He said coalition forces often hear villagers lament that coalition and Afghan troops have come before but didn't stick around. Ajmal Khan, a 24-year-old from Arghandab, has that fear  yet he's giving the government a slight edge in the conflict. "The government can be seen preparing for spring by building up checkpoints so they can control the area in a better and more organized way and close holes that allow the Taliban to enter and cause destruction," he said. "To an extent, we can see that the Taliban are getting weaker. "On the other hand, the government and NATO forces always talk big but ultimately face defeat. This time, we can see some major improvements. How far these improvements will work against the Taliban remains to be seen  when spring comes." Not surprisingly, National Police Col. Fazal Ahmad Shirzad, chief of security for Kandahar province, is already predicting a Taliban defeat when the weather warms. "I'm sure that the Taliban will not be able to fight against the Afghan National Army and Afghan National Police," Shirzad said while eating a quick supper of chicken, rice and bread in his office following a 15-hour day. There are 800 more Afghan policemen patrolling Kandahar city now than at this time last year. "This week we found 60 improvised explosive devices in and around Kandahar," Shirzad, a soft-spoken, determined man with a full black mustache, continued through an interpreter. "I'm telling you something. Those locations  those districts  that the Taliban controlled, we control now." In the past three months, 1,250 Taliban weapons caches have been found in Afghanistan, according to NATO. That compares with 163 uncovered in the same period last year. Since mid-January, 374 caches have been discovered  85 percent in Kandahar and neighboring Helmand province, the coalition said. Forty-one  an average of seven a month  have been found in the city of Kandahar and in Arghandab, a fertile farming area and longtime Taliban stronghold north and west of the city. 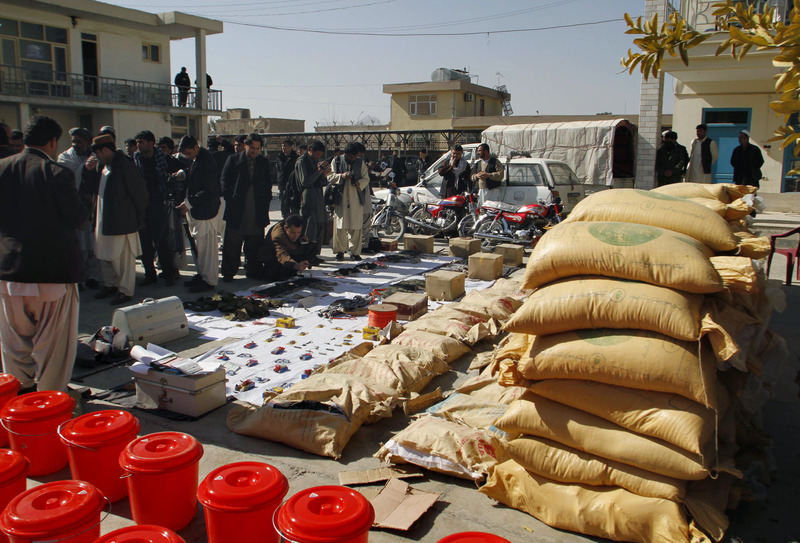 An Afghan security force patrol made a massive haul in the city on Jan. 24. The cache yielded 2,910 pounds (1,320 kilograms) of explosives, 4,300 pounds (1,950 kilograms) of ammonium nitrate used in making explosives, 2,600 feet (800 meters) of detonation cord, a suicide belt, 70 devices to detonate remote-controlled bombs, grenades, a van, three motorcycles and a station wagon, the coalition said. The ordnance was part of the weapons blown up last week in the controlled detonations near Camp Nathan Smith. The Afghan government gave residents advance notice so they didn't panic when they heard the booms. Less foliage during the winter months has made the weapons easier to spot. Residents tired of the fighting also have tipped off troops about caches. A hotline set up in Kandahar is getting up to 18 calls a day  some from people telling Afghan and coalition forces where to look. Cards with the hotline number will be passed out in the coming weeks. Wanted posters of Taliban figures soon will be seen in Kandahar  an effort, U.S. military officials say, to show that they are individuals, not myths or ghosts to fear. After hearing of weapons seizures, some villagers have put guns and ammunition out on the street like garbage so they are not caught with it in a subsequent raid. Afghan and coalition forces also are uncovering Soviet-era bombs, including some the Taliban have packed with new explosives. In November, residents tipped pro-government forces to a 500-pound bomb in a cemetery in Arghandab. Removing the bomb  about as long as a picnic table and with a circumference about the size of a pizza  turned into a work project. Afghans were hired to fill about 500 sandbags, which troops placed around the bomb before it was safely removed with a crane, hauled away and destroyed.